I have elderberry on my property. Last year I tried tasting some, just a couple of the little berries, to which my response was blech! Most of the elderberries are growing below Black Oaks and Ghost Pine and some of it is over 20 feet tall. Is the poor flavor due to the extreme dry summers we have in California or are elderberries not too tasty? The blackberries on my property tend to be on the tart, pucker-up side and don't develop enough sugar. Sometimes we'll pick some sweet ones but not very many. Are you sure they're elderberries? There are look-alikes. Elderberries need to be cooked also, and strained from the seeds, seeds not edible. Black berries are sweeter grown in full sun and picked dead ripe, not just black but falling-off-when-you-touch-them-ripe. Make sure they are elderberries. They should not be eaten raw. especially the seeds. besides that, they are extremely nutritious and even medicinal. They require some acid or they are very blah, we made wine one time and never again. We like them cooked with apples or plums and a squirt of lemon. Can the juice for when someone is sick. You can buy something at horrendous price called sambucol, which is nothing but concentrated elderjuice. Our bushes are getting ready to bloom. a couple of times I am going to make fritters, dipped in a beerbatter and deep fried. sprinkled with some powdered sugar and served with elegant tea. Really, they are fancy. And delicious. I have some dried elderflowers that my father picked and dried the week he died. He said he would like some elderfritters and I made him some and he said they were good. That is my last memory of my Dad, because I went to visit my daughter the day after and he died while I was gone. The elderberries are just starting to bloom here in middle IN. I really enjoy the taste. It reminds me of a cross between grape and berry flavor. I believe it has helped with cold and flu as well. Just make sure to take it as soon as symptoms show. I make several pints of jelly each year and always run out. Elderberries here are blooming. Hope we have a good crop. They are terrible fresh but make GREAT jelly. Don't even think about something like jam because the skins and the seeds are yech. 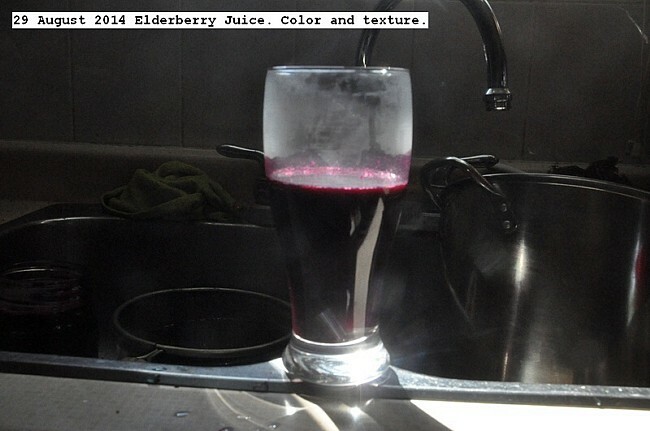 Elderberry syrup is good for cold/flu. 1T twice a day. Have some friends that make elderberry wine but I don't drink wine. They are blue elderberries, a native to this region. I don't know anybody that uses them, but then I don't know many people around here! Regarding the blackberries, a lot of them will shrivel up before ripening. I don't know if it's worthwhile to give wild blackberries some water where they aren't a nuisance. It's difficult to keep them contained, they're coming up everywhere on the property! We love elderberry for jellies and syrup and after the first good frost it seem to set the sugar in them, there not real sweet but they can be eaten. We steam the juice out of them then throw the mash to the chickens, they also make a great elderberry wine. Our elderberries are ripe in August(but with weird weather we may have them early this year) and don't last on the bush/tree long enough for a frost. Another old thread, but I believe I have something to add, not addressed in the other comments. We pick the blooms in the spring and make "Essence of Elderberry," which the wife cans to preserve and when we have a cold, she opens a half pint and mixes two table spoons into a cup of hot tea, along with a little lemon and honey. It is fairly tasty and sure helps reduce the trips to the doctors. At least we believe it does. We have also picked the berries and made "Tincture of Elderberry." It also seems to help with a cold, but it tastes awful , so we probably will not waste the berries on such a terrible tasting product. For those people without access to any elderberries, they can be purchased from commercial growers. One may have to do a little hunting to find a source, but they are out there. Could you please give me more details of the Essence of Elderberry? I'm very interested. The recipe came directly out of a herbal book, but I can not quote source & page at the moment. Most of our books are still in boxes and storage from their being moved last years because of major alterations. Dissolve the 2 lbs sugar in the 4 pts water and Boil the sugar water for 5 minutes, add 2 oz Citric Acid, add the chopped lemon and/or a chopped orange, add the 30 heads of Elder Flowers. Stir well. Cover with a clear cloth. Leave for four days, stirring every day. Strain & bottle. **She does not have the Canning information written down, but because it contains a high sugar content and is also acetic, she said caning as a jelly would probably be sufficient, and probably "water bathing" the Essence of Elderberry would be adequate too. It may take a few weeks, but I will find the book and post the source information and the canning information for you if you prefer the actual source information. Dilute to taste. One Table spoon diluted to taste and taken straight, or added to a hot drink with a little sweetener taken at the first signs of a cold. We normally take two doses daily (One Table Spoon morning & evening dissolved in a cup of hot tea with a little honey and Lemon or Lime juice added to the tea) until the cold is abated. The wife said to tell you the time limit is not critical as the Essence of Elder will not ferment or spoil. She left hers/ours a week and added both a Lemon & Orange in the original batch. She canned in half pints or jelly jars. There are a number of commercial preparation of Elderberry on the market, if you have a health foods store near you, check them out online or at a health foods store. We also purchase the Elderberry Standardized Extract Tablets and keep them on hand during the winter months especially. They run about $10 for a 60 Count bottle. This is not nearly as exacting, as I wish I could be, but without the book before me, it is the best I can do for you at the moment, mythreesons. Hope it helps for the present. I have many elderberry bushes so will try this. 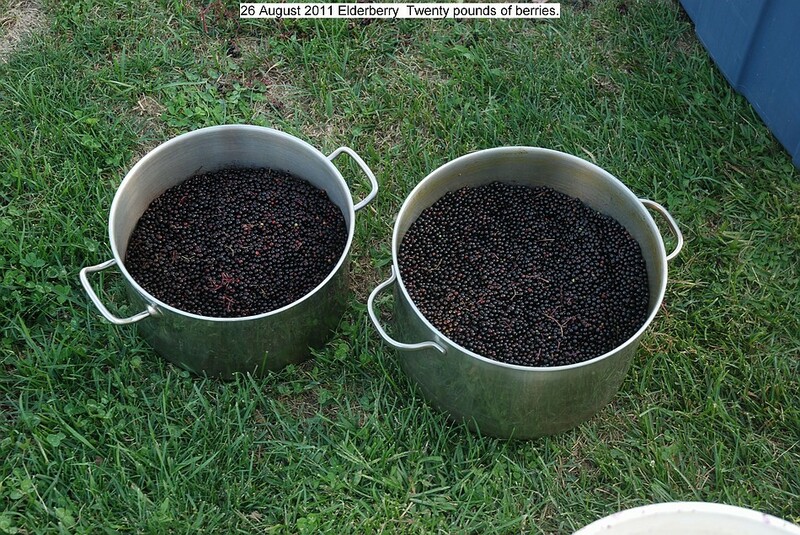 Twenty pounds of elderberries were picked and made into juice. Procedure was remove from support structure, wash, boil gently, and beat into a mash. Strain through a fine screen mesh. Pressure can at 12 PSI for 15 minutes for long term storage at room temperature.It takes about two pounds of berries to make a liter of juice.This will be the last of the elderberry processing for the 2011 season. About 50 pounds were picked and processed this year. Last edited by Durgan; 10-22-2015 at 11:02 PM. Last edited by Durgan; 10-22-2015 at 11:04 PM.